Sadly, my beautiful peaches are almost finished for this year. I’ve eaten them straight off the tree, had them fresh or stewed with home made coconut yoghurt and toasted almonds, put them into a salad and used them as dessert. I’ve even eaten them squashed on toast with vegan cream cheese for breakfast. And I can never tire of them, they are my favourite fruit. Luckily I have also managed to preserve twenty two jars of them to enjoy a bit of summer in the depths of winter. I know it will make me happy when I grab a jar on a dark, cold day in August. I have been preserving tomatoes and stone fruit on and off for years, mostly off. But I have taken to it again recently, since I decided to remake my back yard as a productive fruit and vegetable garden 3 years ago. I now love doing it. For the last couple of years some friends and I have got together to bottle tomato puree in the early autumn. It is far nicer than anything that I’ve ever bought. It is sweet and tastes like tomatoes. You don’t really need specialised equipment to preserve. Sure, it helps and it usually means you will have less in the way of failure, but you can also preserve using clean recycled jars with metal lids that have a sealing strip inside where the lid meets the glass. These lids are of the popup kind where the centre is depressed when sealed, and when you open the jar the centre of the lid pops up and gives a reassuring little inrush of air. You also don’t need to have an orchard of fruit trees to preserve. When fruit is at its peak it is cheap. This is the best time to preserve it. It doesn’t have to be perfect either, as long as it isn’t off, just cut the dodgy bits away. We’re not showing it at the local agricultural show for prizes. At least I’m not. Mine is for eating! 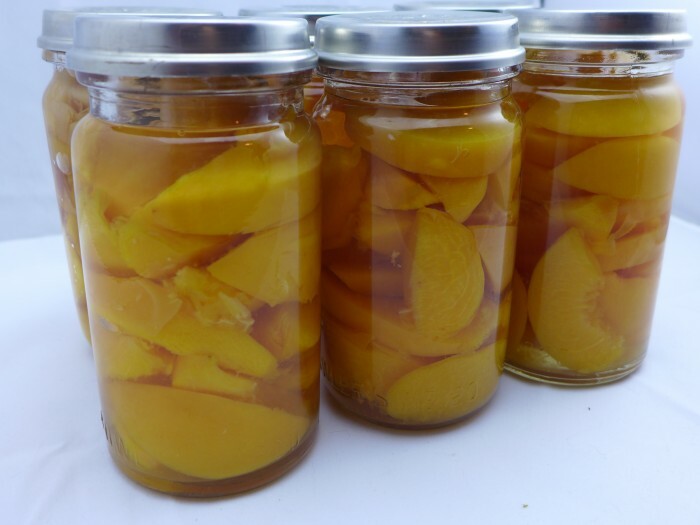 My preserved fruit is usually a mixture of home grown, donated and bought. Dedicated preserving jars do last forever though as they are made of thicker glass (I have some that date from the 1960s), but recycled jars will be OK if you handle them carefully. It is the lids that will give way eventually as the sealing strip deteriorates. But you can buy jar lids fairly cheaply. But if you’re in this for the long term then preserving jars are not expensive, if you consider that they will pretty much last forever. You can find them being sold on ebay at about half the normal price too. I built my collection from garage sales and hand me downs. I’m a cheapskate, I’ve never bought a new jar. I also like to preserve in small batches. My pot takes seven jars so that’s how many I usually make at a time. This way it doesn’t become a chore. There’s no need to drown in fruit for the whole day until you’d be happy if you never saw another peach. I can have a batch prepared in about twenty minutes. Take your jars and pack them with pieces of fruit, leaving as little space as you can without squashing the fruit too much. I add a teaspoon of sugar to mine. Fill the jar with cold water to the brim. That’s it, all that remains is to put the lids on and boil the hell out of them to kill the bugs and vacuum seal the jars. Put the lids on firmly and put the jars into a large saucepan on a rack and cover with cold water. Bring to the boil and let boil for at least 15 minutes. Remove from the water (I have some special tongs which are useful for this), Grab a tea towel so you don’t burn your hand and check the lids are on tightly and give the centre of the lid a firm push. Allow to cool completely. If you are using recycled jars, the lids should “pop” down as they cool so that they are slightly concave. If they are not then you possibly don’t have a good seal and you should put the jar in the fridge to eat in the next week. I’ve always wanted to do this! Cover with cold water? All the way over the top? No one in my family has done this since the early 1960’s and Grandma can no longer remember what she did! It is something I’d love to do! Can you please clarify this point so I can give it a good go! Hi Kathy, yes, cold water and to the brim of the jar. I’ve edited the post to include this step, thanks for pointing it out!